1. Go to Control Panel >> Hardware and Sound >> Power Options >> Edit Plan Settings. Go to Control Panel >> Hardware and Sound >> Power Options . 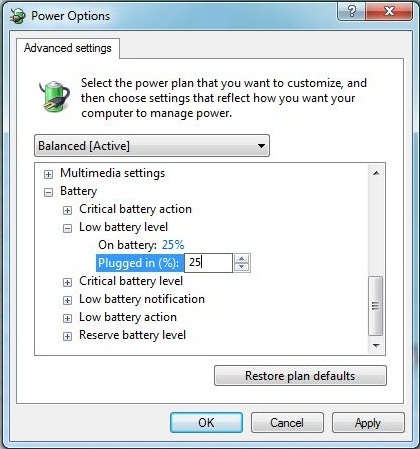 2. select a power plan to edit and choose change plan settings. 3. choose change Advanced power settings. 4. Scroll down the list of manageable options until you see the Battery option. 5. Here you can enable an audio alert for when the battery reached Critical level and for when it is low. The great thing is you can select just how much those levels are. Levels can be set for both when your system is plugged in and/or on battery.